This article explains how to place Adsense below post title in Blogger. The tutorial will not be complicated if you understand it properly. Do keep a backup of your template before any changes! Why below post title? Because it is the position with the highest CTR (click-through rate). In other words the ad placed there will bring the more money. Adsense ads positioning guideline also suggest that the best performing Adsense ad position is above the primary content i.e. above the blog post.Placing an ad below post title (above post content) is a very easy for all new and old bloggers. All you have to do is create an ad unit on your Google Adsense Account, get the code and add it to the specified location in your blog template. 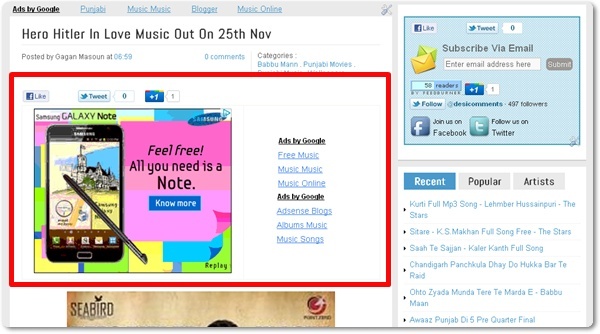 First of all Log in to Google Adsense to create a new ad unit for blog. For best results choose wide ad size - either 336x250 Large Rectangle or 300x250 Medium Rectangle format.Assign a new ad channel to it for performance monitoring purposes. After completed the steps get adsense ad code. You need to encode your adsense code. Go to HTML encoder or Quick Escape paste your adsense code in the box, and click Encode. The ad won’t appear if you use the original unescaped ad code. 2. Press Ctrl+F and Find the Following Code. Note - The conditional tag in lines 1 and 3 will make the ad appear only on post pages. If you want the ad to appear on all pages, just remove the lines. 4.Save your template and view your blog. If you need our help then ask us via comments. Please share this post with your friends also and subscribe us also. yes it's not working also to me... what do you mean by post the code below? below the ? It means under post title. Do not put adsense code directly, before it please decode your Ad code. I think this code presents twice in your blog.